Alex Rodriguez turned in a memorable Independence Day and kept the celebration going the next day when he became the PGBL’s career home run leader. Two days after hitting his 20th home run of the season at Oakland, Rodriguez hit his 600th and 601st career homers in the Toronto Tigers’ 9-6 win at Flagstaff on July 4. A day later in Toronto, A-Rod hit a two-out homer in the ninth inning to move ahead of Manny Ramirez for the all-time lead (dating back to 1995). After sitting out all of 2015, Rodriguez looked to build on a career total of 579 and accepted the designated hitter role for the Tigers this season when the franchise relocated from British Columbia. His big first week of July started on the 2nd when he took the first pitch he saw from Oakland’s Sonny Gray out to center leading off the second inning, although the Tigers went on to lose 3-2. 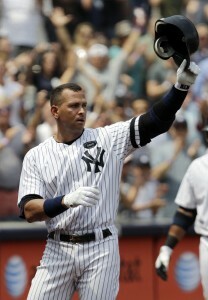 Alex Rodriguez tips his hat to the crowd after hitting the 600th home run of his career. Home run No. 600 came in the sixth inning of a scoreless game in Arizona when he crushed an 0-1 pitch from Elk starter Alex Morgan for a two-run shot to to deep left to stake Toronto to a 2-0 lead. With the Tigers down 6-5 in the ninth, A-Rod banged an 0-1 delivery from Sergio Romo out to left to start a four-run rally as he joined Ramirez at 601. Back in Toronto against Las Vegas, Rodriguez saved his historic blast for the end when he drove a 2-1 pitch from Pedro Strop down the left-field line with two outs in the ninth. The Gamblers finished off a 5-2 win but A-Rod had made his mark. He would only hit four more homers with Toronto before getting traded to playoff-bound Tijuana in a deadline deal, the second midseason move of his career sending him to his sixth franchise in 22 seasons. He made his Tequila Swiggers debut on Aug. 2 and hit a two-run homer off Athletes closer Andrew Miller in the ninth inning of a 4-3 loss. Rodriguez went on to hit 10 homers down the stretch to help Tijuana secure a wild-card playoff berth. He will enter 2017 looking to build on 616 career long balls. A-Rod now has 2,874 career hits as the active leader, trailing only Derek Jeter (2,909) and Ramirez (2,874). With 1,821 RBIs, he needs just 23 more to surpass Manny as the career leader and he already holds the career marks for runs scored (1,762) and games played (2,648). Among active players, the next closest on the home run list is Calgary’s Albert Pujols (522), who joined the 500 club with a solo shot off Chicago’s Jared Hughes in an 8-2 home win on May 26. A Rod debuted in 1995 with Chicago and played sparingly in his first two years but helped the Cardinals win the 1996 title. He hit 98 homers in six seasons with Chicago and then was traded to Charlotte, a franchise that relocated to Louisville after his first season with the Hornets. He spent three years total with the Long Rifles franchise, totaling 114 homers before getting dealt to Vancouver after the 2003 playoffs when both Louisville and the Wildcats blew 3-1 leads in the League Championship Series. Rodriguez hit 141 homers in three seasons with Vancouver, including career-best 59 in a Triple Crown season of 2006 that saw him win the first of his two MVP awards. But he got traded twice the following offseason, first to the Chicago White Stockings and then to Key West. He played three full seasons with the Penguin, highlighted in 2008 by a 55 regular season homers and seven more in the postseason as he earned both his second MVP and second World Series ring. He remained with the franchise when it relocated to Dublin in 2010, totaling 131 homers with the club before a midseason trade moved him to B.C. He hit 27 homers in the second half of 2010 with the Bucs, then added 30 in each of his first two full seasons with B.C. before managing four in each of the next two seasons, plagued by injury and suspicion. The 2016 PGBL season enters its final day with one division championship and one playoff berth still up for grabs, with the Las Vegas Gamblers and Compton Outlawz vying for the final South League wild card. Las Vegas holds a one-game lead on Compton, with the Gamblers due to pitch Lance Lynn against Twin City while the Outlawz send Chris Archer out against Louisville. Compton needs to win and have the Truckers play spoiler to force a one-game playoff at Las Vegas. Whichever team earns the spot will grab the No. 4 seed in the SL behind Oakland, St. Louis and Tijuana. The Athletes charged to the best record in the league, clinching the Cactus Division and the top overall seed with ease. St. Louis outdistanced the field in the Confederate Division and Tijuanja retooled at the deadline to hold on to the first wild card spot. In the North League, the season-long battle royale in the Norris Division will end with all three contenders separated by one game. Boston and Cleveland sit at 98-63 entering the final day, while Chicago finished at 98-64 and claimed the No 4 seed as the second wild card. The Tribe hold the head-to-head tiebreaker and host last-place Pittsburgh, while the Braves entertain Maple Leaf Division champion Ottawa. Cleveland and Boston will square off in the first round of the playoffs, with the division winner getting home field advantage. The other first-round matchups will see the Argonauts facing the Cardinals, the Clydesdales battling the Tequila Swiggers and the Athletes drawing either Las Vegas or Compton. On the opposite side, Twin City, Flagstaff and London have secured the top three slots in the draft order. While Brooklyn is locked into the No. 10 spot, the rest of the order remains to be finalized. The Cleveland Tribe made the biggest splash of a hectic trade deadline day, landing ace Jake Arrieta from Louisville. Meanwhile, Tijuana made a push for a wildcard berth in the South League by acquiring nine new players in a series of six trades and a free agent signing. Arrieta joins the Tribe in a heated Norris Division race after going 13-5 with a 2.48 ERA and 155 strikeouts in 148-2/3 innings with the Long Rifles. He bolsters a Cleveland rotation headed by All-Star starter Michael Pineda (15-1, 3.11). The acquisition of Arrieta didn’t come cheaply for the Tribe. Louisville gets Jurickson Profar and a 2018 first-round pick, along with two Top 35 prospects as players to be named later. The Tequila Swiggers reached the end of July 28-1/2 games behind Oakland but tied with Las Vegas for the final playoff spot. They strengthened their rotation by adding Cole Hamels and Ubaldo Jimenez and bolstered their bullpen with Shawn Tolleson, Ryan Webb and Adam Conley. Additionally, slugger Alex Rodriguez heads south of the border, as do Brandon Phillips and Melvin Upton Jr. Outfielder Jarrod Dyson was signed as a free agent. The Swiggers had to give up Jake Odorizzi, Delino DeShields Jr., J.J. Hoover and seven top prospects. They also parted wtih five picks in the first four rounds of the next draft, two seconds and two thirds in 2018, and a first-rounder in 2020. League-leading Oakland made a pair of trades to bolster its bench, picking up catcher Jarrod Saltalamacchia and outfielder Darin Ruf. Boston followed Cleveland’s Arrieta deal by landing outfielder Dexter Fowler just ahead of the deadline. -Tijuana trades Jonathan Gray, LON 2 (2017) and LV 3 (2018) to Toronto for Ubaldo Jimenez. -Tijuana trades Vincent Velasquez, Jason Kaprielian, and JJ Hoover to Twin City for Shawn Tolleson and Adam Conley. -Tijuana trades Jake Odorizzi, CGY 2 (2017), TIJ 2 (2017), and TIJ 1 (2020) tp Calgary for Cole Hamels and Ryan Webb. -Dublin trades Gregory Polanco, Jorge Mateo and a PTBNL (Kolby Allard) to London for Yu Darvish. -Tijuana trades Delino DeShields, Amir Garrett, and CLE 2 (2018) to Toronto for Alex Rodriguez and TOR 5 (2017). -Cleveland trades Jurkison Profar two PTBNLs (Robert Stephenson, Austin Meadows) and CLE 1 (2018) to Louisville for Jake Arrieta and LOU 5 (2019). -Tijuana trades Domingo Santana, Frankie Montas, TIJ 4 (2017) and TIJ 2 (2018) to Memphis for Melvin Upton Jr.
-Oakland trades Alex Avila and PTBNL (Michael Feliz) to Louisville for Jarrod Saltalamacchia. -Tijuana trades Lourdes Gourriel Jr., CGY 3 (2017), and TIJ 3 (2018) to London for Brandon Phillips. -Las Vegas trades Ketel Marte and James McCann to Memphis for Trevor Plouffe, Martin Maldonado, LV 4 (2018) and LV 4 (2020). -Oakland trades Curt Casali and PTBNL (Justus Sheffield) to Toronto for Darrin Ruf. -Boston trades Rubby de la Rosa, PTBNL (Billy McKinney), LON 4 (2017), BOS 5 (2017) and TOR 3 (2018) to London for Dexter Fowler. -Tijuana claims on Jarrod Dyson. -Twin City cuts Lewis Thorpe. Adam Jones was moved for the second time this offseason, heading from Boston to Las Vegas along with Didi Gregorius for relief pitcher Carson Smith and a package of draft picks. Louisville picked up George Springer from London, also getting Pedro Alvarez while parting with Julio Urias, Beau Burrows and Bryan Morris. Boston then dealt a package of six players and two draft picks to Twin City to acquire Starling Marte, Rusney Castillo and aging starter Bartolo Colon. Then Tijuana joined the mix by snaring Adam Eaton along with Jake Peavy by shipping pitcher Alex Wood and three picks – including two first-rounders – to Flagstaff. May has been a hectic month in the PGBL, with the top teams asserting themselves and making major trades. The first of the big deals saw star second baseman Robinson Cano move from Tijuana to Dublin. The Guinness picked up Cano along with Matt Garza, Jon Jay and Jonathan Broxton in exchange for Prince Fielder, Shin-Soo Choo, Jedd Gyorko, Jon Gray and a bevvy of high draft picks. In his first 12 games with Dublin, Cano hit .396 with a .921 OPS. The next big move came when Calgary pulled off an intradivisional deal to get Edwin Encarnacion and Howie Kendrick in a seven-player swap with British Columbia. The Bucs got a solid return headlined by Garrett Richards and Alex Gordon. 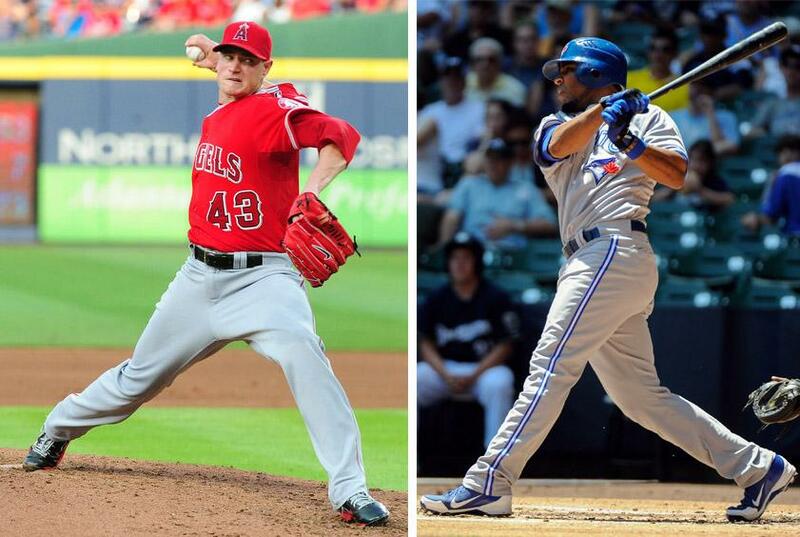 Other deals saw the Maple Leaf-leading Ottawa Argonauts pick up Brett Gardner from Tijuana for James Shields, Confederate-leading Compton add Coco Crisp from the T-Swiggers, and the Cactus-leading Oakland Athletes acquire Adam Lind, Brandon Crawford and Angel Pagan in two separate deals. Ottawa, Oakland and Compton all enter June with 36 wins, with big surges keying the Argos and Athletes. Ottawa has won 14 of 17 to take a 3 1/2-game lead over the Roughnecks. Oakland used a 14-game streak to build an 11-game advantage on Las Vegas. The tightest race is in the Confederate, where the Outlawz are 1 1/2 in front of St. Louis, which had an 11-game surge of its own in May. Dublin is 5 1/2 games back of the Clydesdales but in the second wildcard spot in the SL. In the Norris, the tables have turned as Chicago has moved three games ahead of Cleveland. The Cardinals have won nine of 11 while the Tribe endured an eight-game skid and have dropped nine of 10. Oakland boasts some of the top individual performers as Jose Altuve owns a league-leading .379 average and 89 hits, Andrew McCutchen has 51 RBIs and Ian Kennedy and Dallas Keuchel claim matching league-best 9-1 records. Memphis’ Jose Bautista has 22 homers to lead the way, four in front of Guinness catcher Devin Mesoraco. Tribe first baseman Anthony Rizzo is an early MVP candidate with a Rizzo .339/.453/.656 slash line that tops the league in both on-base and slugging. Ottawa’s Collin McHugh has a 2.02 ERA to lead the PGBL, while teammate David Price has 88 strikeouts and trails Vancouver’s Chris Sale by three.